Datsun Redi-GO interiors are quite neat and clean. On the inside, you get decent space but the rear seats can feel cramped. The dashboard is very simple, in a good way, and cluster free. You get a sporty feel once you step inside the crossover and the silver accents in the cabin further add to the looks of the interiors.The air-conditioning in the car is pretty likeable and can help you stay cool throughout your drive. The car gets low fatigue seats that are designed in a way that they give you an excellent support while driving, thereby ensuring comfort even during long drives. This Redi-GO 1.0-litre AMT continues to be powered by the same 999cc three-cylinder petrol mill from the manual trim. So the power output of 67bhp and 91Nm of torque remains the same. However, the five-speed AMT gearbox in this one uses hydraulic actuators and sensors, thus eliminating your efforts in clutching or shifting gears. The engine characteristics aren’t any different as it still starts with a judder and settles into a quiet tone. Sure, at high revs it doesn’t really sound great, but it still revs quickly and feels refined. Let’s get straight to the AMT gearbox then. As soon as we left the dealership to hit the congested and chaotic roads of Delhi, its typical AMT nature became evident. The gearshifts aren’t as smooth as the ones on conventional automatics, but Datsun has done a good job in containing the shift shock. You will observe the lag in gear shifts only if you step on the gas abruptly. Otherwise, the linear throttle response helps in upshifting without a fuss and makes driving enjoyable. Thankfully, it also gets the ‘Creep’ function like the Nano, Dzire, Duster, etc. It is a relief, especially in traffic, to let the car creep ahead with the release of the brake pedal. It should also help new drivers to start off jerk-free and without letting the car roll backwards on an up-slope. Another advantage, as against the rotary gear knob in the Kwid AMT, is that it gets the option of changing gears manually. There’s a manual override to provide a better control with engine braking especially while coming down a hill. It also helps while planning a quick overtake. The low speed ride still continues to impress and by correctly modulating the pedal, one can easily cruise around the city. The car’s 185mm ground clearance is good enough to clear everything that comes its way. We went over many undulations, potholes and rough tarmac without worrying. Never did we hear any jolt within the cabin or the suspension bottom out, thanks to the long suspension travel and high profile tyres. The soft set-up made the ride a little bouncy but didn’t put us off. However, it is the corners where the narrow tyres and tall height make you feel that things might go awry. A lack of grip and body roll also come into the picture. So even if the car has a quick turn-in and the steering is light, it doesn’t inspire confidence in you to go fast around a set of twisties. The brakes lock up under hard braking, pointing to the absence of ABS too. But then, all this is predictable even if the car lacks the surefootedness at high speeds. The top-end variant of New Datsun Redi-GO features driver side airbags as well, which makes for a very good offer in this segment. Along with this, the car gets disc brakes at the front and drum brakes at the rear to give the driver a confident drive. 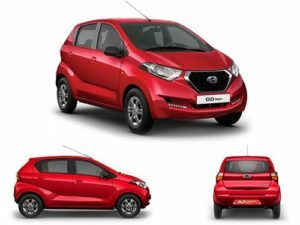 The Datsun redi-GO is a good car if you’re strictly going to drive in the city and want the convenience of an AMT. The car has light controls and decent punch for regular jaunts. Don’t expect it to drive like a large hatchback and it won’t disappoint you. The car itself is fairly basic & compact and doesn’t get too many features either. However, it’ll have low running costs for sure. Datsun doesn’t have many service centres too and that could be an issue for many people. All in all, the redi-GO’s only USP is the AMT for now, because on other counts like space, comfort and service, there are rivals that fare better.